I am pleased to share with you the books of P.K. Adams. She is the author of The Greenest Branch- A Novel of Germany’s First Female Physician (Hildegard of Bingen Book 1). Many reviewers have used the words “beautiful” and engrossing” to describe this book- and I agree. And I’m delighted the second book that concludes the story of Hildegard, The Column of Burning Spices, will release on February 1, 2019. I have read both books and these are the kind of books I am eager to read- far from being dry history, they are like story books that open in to a fascinating world. Author Adams graciously shared some information about her books, and I have included my reviews, too. I know they will appeal to you, as much has they did to me! 900 years ago. What would it be like to go back to medieval times and see the towns and castles and how people lived? Do you imagine that it would be primitive and simple? What would it be like to follow a young girl of those times? Do you think that she would have had much of a life? Well, you can go back in time and see that world as if you were there, thanks to author P.K. Adams’ vivid and engaging story of Hildegard. The Greenest Branch is the first in a two-book series based on the true story of Hildegard of Bingen, Germany’s first female physician and one of the few women to attain that position in medieval Europe. Readers, don’t worry about it being a two-book series. The first book is an engrossing and complete story and ends at a good point of closure. While I’m eager to read the second book, the first book was a beautiful experience and stands on its own. Hildegard and her world are presented with eloquent word pictures. I was surprised that the world of the Rhineland and Europe was so sophisticated. By that time, early 1100’s, the Church and Emperors were well established, although feuding. Towns and trades, educational centers, and laws and the arts were all in place. Opportunities for women were more in line with what I expected. Hildegard was the 10th child of well-off parents who loved her. Because she was the tenth, she was the “tithe” and was dedicated for Church work. She entered the Abbey of St. Disibod when she ten. The new Abbey was a stifling, strict place for a smart girl who loved nature but Hildegard’s natural abilities and her relationship with caring and educated church people helped her to grow and learn and create her own special vocation. Hildegard tells her story in the first person which makes her seem so real. The writing style and voice is meditative and lyrical. Although there is detailed historical information, it is presented in a clear and readable way that makes the story flow with passion and excitement. Conflicts of theology and the rights of women are presented in a balanced and thoughtful way. I highly recommend this book and I am looking forward to the second book in the series. The Column of Burning Spices is the second part of a series based on the life of Hildegard of Bingen, a 12th century German composer, mystic, writer, and physician. I first learned about Hildegard in a music history class in college. I became fascinated by this famous medieval woman who was not a royal. How did she manage to achieve such prominence without the prerequisites of high birth? And how did she navigate the societal strictures that prevented women from accessing education, living independent lives, and having a public voice? Part one, The Greenest Branch, (which is currently a semi-finalist for the 2018 Chaucer Awards for pre-1750 Historical Fiction and will compete for the Grand Prize in April 2019) focused on Hildegard’s early life, after she had been sent to the Benedictine Abbey of St. Disibod in the Rhineland at age eleven. It traced her struggle to secure an apprenticeship with the abbey infirmarian and then work her way up to the status of physician. Along the way she had to fend off repeated attempts by Prior Helenger to stop her from treating patients and writing about medicine, and to relegate her permanently to the convent’s enclosure. By the end of the book, it was clear that Hildegard must leave the Abbey of St. Disibod if she wanted to live her life and her vocation as she saw fit. But in order to do that she needed to save a lot of money and obtain her superior’s permission. But Hildegard has a plan. She shares her writing with Abbot Bernard of Clairvaux. He is both feared and respected throughout Europe and was a great admirer of Hildegard’s late predecessor at the helm of the convent, the ascetic Jutta von Sponheim. If he sanctions her activities, the monks will be powerless to stop her, and she might even win independence and establish her own foundation. But will Bernard take up a woman’s cause and subvert centuries of established tradition? And will it be enough to protect Hildegard from a betrayal that lurks closer than she could ever imagine? The Greenest Branch and The Column of Burning Spices are set against the backdrop of the lush oak forests, vineyard-covered hills, and sparkling rivers of the Rhineland, and bring to life the story of one of medieval era’s most fascinating and accomplished women. This memorable line from this well-crafted and researched historical novel reminded me of the verse from Isaiah, “The voice of him that crieth in the wilderness, Prepare ye the way of the LORD, make straight in the desert a highway for our God. (Isaiah 40:30).” And in many ways, Hildegard of Bingen was a person of Biblical proportion. Readers were introduced to Hildegard in the first book of the series. The Greenest Branch told of Hildegard’s beginning years as a young novice at the Abbey of St. Disibod, in what is now Germany. Although she was young and missed her family, she flourished as she pursued knowledge and developed her medical skills. Hildegard knew she was destined for more. And in the second and final book, The Column of Burning Spices, readers see the unfolding of Hildegard’s fruitful ambition. The book begins with Hildegard receiving exciting news from Abbot Bernard of Clairvaux. She had sent a new chapter of her book, Scivia, a parchment writing of her thoughts on faith and redemption to the Abbot and she was delighted by his positive response. With this affirmation, she is now ready to leave St. Disibod and establish her own foundation and convent. This is the main focus of the story, presented with the splendor and vibrancy of the times. Many familiar characters are featured in this book. We meet fascinating people, whether serfs or villagers, Hildegard’s convent sisters, knights, Archbishops, Emperors and Popes. And of course, Volmar, her dearest friend, is her companion along the way. “The knowledge I share is the fruit of the intuition God has bestowed on me, not of my own reasoning.” Hildegard’s works include three great volumes of visionary theology; a variety of musical compositions for use in liturgy, as well as the musical morality play Ordo Virtutum; one of the largest bodies of letters (nearly 400) to survive from the Middle Ages, addressed to correspondents ranging from popes to emperors to abbots and abbesses, and including records of many of the sermons she preached in the 1160s and 1170s; two volumes of material on natural medicine. “You have a mission to fulfill and a driving passion.” Some of her many passions and accomplishments that fascinated me were her medical skills. Hildegard recommended fresh air and a recovery garden for convalescents, she created house for lepers, and may have diagnosed diabetes. Her intellect and curiosity are also featured. The story also involves a mystery. When a dead body is found, Hildegard helps to solve the matter. The author’s descriptions of the times, places, seasons, daily life are infused with Hildegard’s love of “Viriditas”- the busy life-energy of the universe. Music was a vital part of life for Hildegard as was nature. The author creates vivid and lovely word pictures, “…a late afternoon, a few days before midsummer, the time of day when the scents of flowering herbs are strongest, and the busy activity of insects begins to subside.” We are also treated to scenes of daily life and descriptions of food and everyday meals, “bread and honey, cold meats, slices of cinnamon dusted apples”. By the end of her life- such was her fame that Hildegard could have impacted the Church or the Emperor. To me, this book is a treasure and a joy to read. I wish it could be produced as an illuminated work, as the books in Hildegard’s time were. The Column of Burning Spices has a complex and fascinating subject, yet it is clear and easy to read. Hildegard is likable and I would love to meet her- and I did through this book. The author’s skill truly opens the world of 900 years ago to us. Highly recommend. Thanks to the author for a review copy. This is my honest opinion. P.K. Adams is the pen name of Patrycja Podrazik. 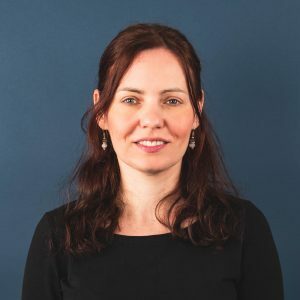 She turned to fiction writing after a career that included working as a book publicist in New York and a copywriter and editor for a marketing company in Boston. She is a blogger and historical fiction reviewer at www.pkadams-author.com. 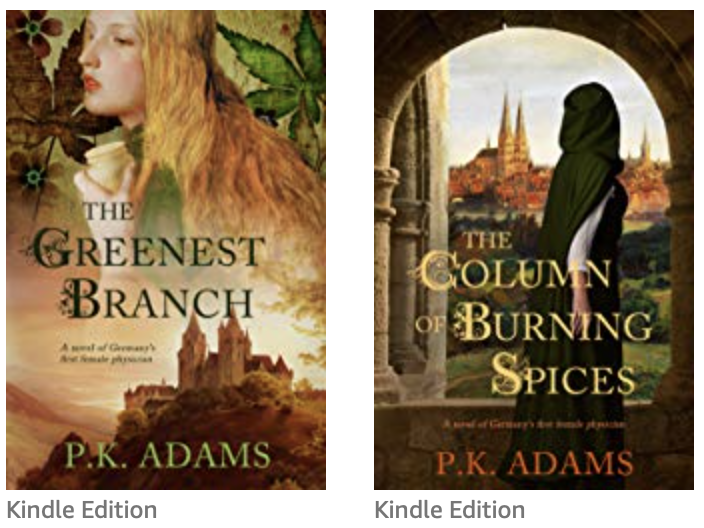 Her debut novel, The Greenest Branch, a Novel of Germany’s First Female Physician, was published on Amazon in June 2018 and is currently a semi-finalist for the 2018 Chaucer Book Awards for Pre-1750 Historical Fiction. The second book in the series, The Column of Burning Spices, will be released in February 2019. She is a member of the Historical Novel Society and lives in Boston, Massachusetts. Oh this one looks really interesting. Thanks for sharing another great author and book. You do have a gift for finding great ones. Thanks! Beth- thank you! Yes, I was delighted to get to know this author and her books. And it’s fascinating to read about a time so far away, but still so connected! Thank Jessie- it truly is a beautiful book about an amazing woman. Interesting how books enable us to connect with lives from over 900 years ago! The Column of Burning Spices seems very interesting, thanks Jena!